I looked up the word stockman in the Websters dictionary to find out what the definition is and it says it is: one occupied as an owner or worker in the raising of livestock". When I think of a stockman in our hobby I think of one who raises livestock but in addition one who has a detailed plan and structure for breeding specific features using line breeding. Each bird has a place in the breeding processes and a bird with inferior features that stray from the plan are strictly culled. I would say Andy is a true stockman. I have known him now for a couple years to which we have had numerous conversations about the birds. 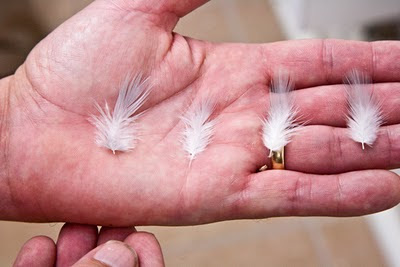 Feather of the Hind stud. I guess in the beginning of a friendship you compare information based on your experience and understanding. It became apparent that Andy is disciplined and well focused in his plan to which I admire. I have been watching his progress and through our discussions Andy told me he had been working on the feather structure in the head. I have noticed of late that he has achieved in this area. He is now an Intermediate breeder but I believe is one to take note. In 5 years he has come along very well, although Andy told me that he has been breeding birds of some sort for 30 years. He used to help his uncle with his racing pigeons along with some exhibition budgerigars. In 2010 Andy showed in 2 shows and won best Novice any age in both shows. 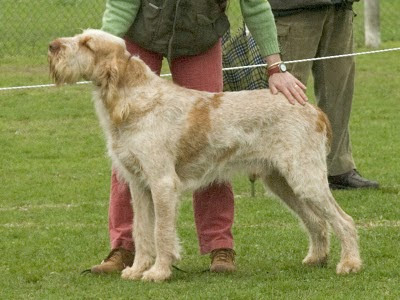 Andy also has a passion for Italian Spinone dogs that he plans to breed in the future. We arrived at Andy's home late morning and were served tea. Recently Andy completely renovated his living room with a beautiful stove for heating. After some friendly introductions we headed out to the back of the property where the Aviary is. 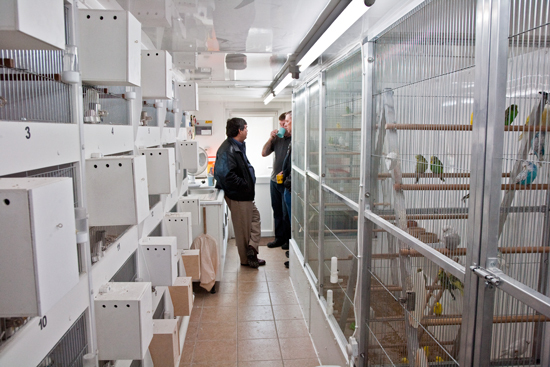 It is a long but functional aviary. The flights are on the left side opposite to the breeding cages. I noticed that the flights extend down into the floor to make good use of limited space. He is using metal tubing with long wire for the flights. 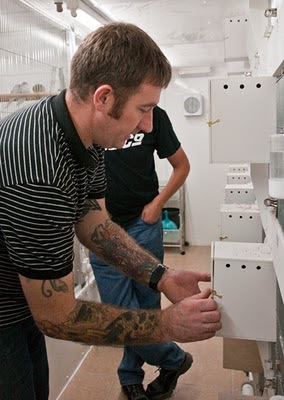 The breeding boxes are made of plastic and actually extend into the breeding cage something I had not seen before. Andy began to start pointing out related pair and we could see what he was trying to achieve. 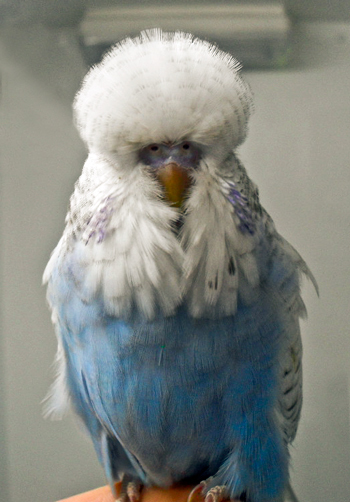 I have 2 main families in my stud of exhibition budgerigars, the first family are based on Joe Mannes bloodline from Germany. I have used a few outcrosses with this family being mostly Huxley and Marchant based bloodline. I have been very careful to keep pairing the best related birds back together every other year to keep the families strong. This family is all spangles and yellowfaces. My other family of birds are based on Daniel Lutolf in Switzerland, both pairs have produced well. These bloodlines are knitting together very nicely with superb results, very soon this will be known as the Hind bloodline. Feather became part of the discussion and we started to talk about Mannas, Lutolf, and Huxley and Marchant feather and the combination of feather. Our discussion once again went to density of feather. 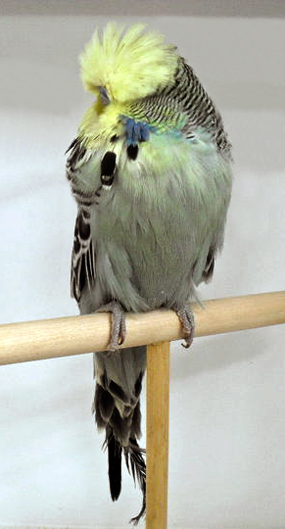 We had discussed this at some of the other aviaries we had visited but Andy was able to pull feather from these different named breeders that we could compare the under feather and density of the feather barbs. 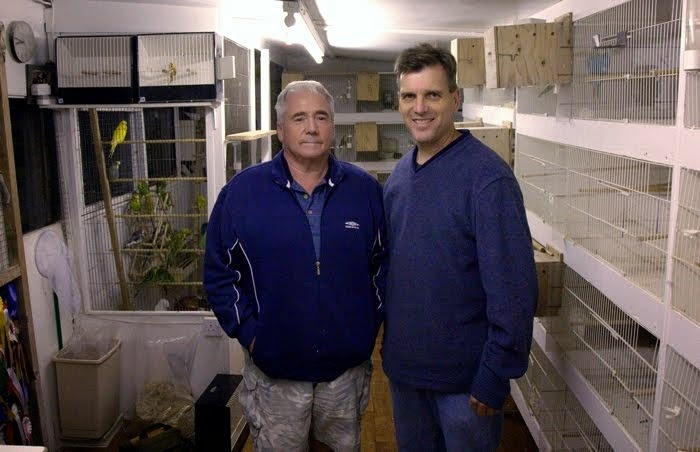 My birdroom was completed on May 20, 2009. 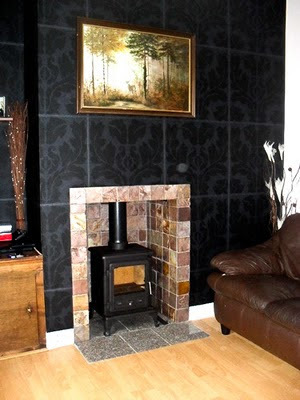 It is fitted with full spectrum lighting and two 8 inch extractor fans and red pygmy night lights that are controlled with electric timers. 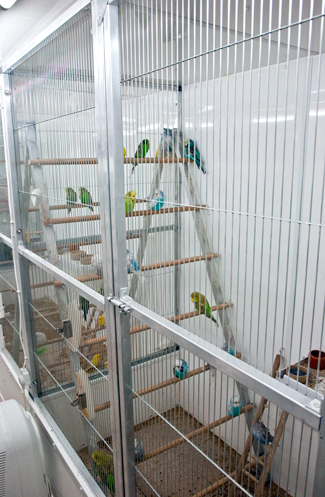 There are 28 breeding cages with 2 flights and 1 baby flight. I wish I could have taken more pictures, but our time was limited. I have to say Andy is one of my most trusted friends in this hobby. He is very honest and supportive to hobby members he comes in contact with. I know he will continue to succeed because he is determined to stay the course. Andy says "True stockmen are a rare breed they are born not made". I can only wish him the very best, and I will take note. Very nice birds and very good aviary !